Daily advice and tips dedicated to health, beauty and wellness. Bunion as commonly known or hallux abducto valgus as usually referred in medical term is a deformity characterized by enlargement of the joint base of bone or tissue around the joint at the head of the big toe. 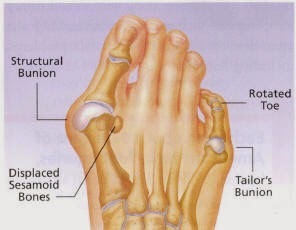 Bunions occur as a result of misalignment of bones and when the pressure is applied to fall unevenly on the joints and tendons to the side of the big toe. There are several other reasons attributes bunions some primarily is caused by tight, high-heeled, too narrow and ill-fitted shoes. Genetic factors can also be considered as of the reasons that causes bunions. Deformity and enlargement of the big toe joint that usually causes pain, redness, swelling and tenderness in the area around the joint. There are surgical and non-surgical treatments. Surgical treatment is used by removing the abnormal bony enlargement and the realignment of the bones of the joint. This method of bunion surgery is called bunionectomy. There are many types of surgery to this operation depending on the degree and factors of deformity. A non-surgical treatment includes cushioning the area with padding or tape or wearing custom orthotics to provide better movement and stability of the foot. Wearing well-fitted shoes may also prevent bunions. Stretching exercises are sometimes prescribed to reduced tension on the inner part of the joint of a bunion. There is available bunion corrector or bunion pad that you can purchase to correct, and ease bunion pain. When non-surgical methods do not provide relief, surgery may be needed. Papaya is a pear shaped fruit that is available throughout the year. Papaya is not only a delicious fruit it’s full of medicinal and health value. 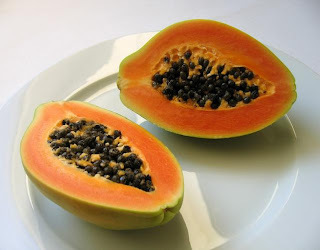 Papaya contains enzymes called papain and chymopapain that can help you if you’re having indigestion problem. It also contains natural fiber, vitamin A, C, E, folate, carotene and essential minerals. Ripe papaya can help prevent cancer and can also help prevent cataract formation. Papaya is also good on skin. Many beauty products contain papaya as their ingredient. Papaya is effective in skin lightening because it contains enzyme papain that helps to dissolve dead skin. Papaya plant is not hard to grow, you can even plant it yourself in your garden to have plenty of papaya fruit in your diet. We sometimes take papaya for granted, both green and ripe papaya is rich in health and medicinal value so start eating papaya for a strong immune system! If you're having problems with acne then you are not alone. A lot of people in this world suffer the same problem that you have.Having acne can lessen your self-esteem and may cause you to lose your social life. It is important to prevent and cure acne. Acne most often occurs during adolescene stage and continues into adulthood. Acne in adolescene most often caused by increase of testosterone which both male and female gender accumulate during puberty. Also acne results from the pores on the skins surface becoming blocked, the follicles under the pores have a hair and a oil gland in them, the oil gland is designed to help keep the skin lubricated, but some times it produces to much oil and that is when the problems start. 1.Do not pick your acne, this may leave you some scars and can cause infections. These are some of a basic and helpuf acne prevention tips to start with. There are many reasons of having gray hair. Typically it is an age oriented. But the problem is if it happen at an early age around 20's and 30's. It is called premature graying of hair and the reasons of this differs. Premature graying of hair can be caused by hereditary. It is where some persons hair graying at an early age. Also illness can be the caused of this premature graying of hair. One of the most common reasons of premature graying of hair is the daily stress the we encounter, anxiety, tension. Another most common reason can be due because of B12 deficiency, a thyroid imbalance or anemia. Diet plays a large role in graying of our hair. That's one of the things we should be aware if we're having this sort of problem. How to prevent the graying must always start with the food we eat. Healthy diet is always good for our body and it can do no harm. One must have food that is rich in Vitamins A and B. Vitamin A is found in dark green vegetables and yellow fruits and Vitamin B in yeast, yogurt, cereals etc. Ensure that the diet also includes sufficient amount of proteins and minerals. There isn't any way of understanding whether pimple prevention is essential until the dreaded pimples actually crop up and won't go away on their own. Nevertheless, it's a safe bet that most teenagers and a large number of adults are going to have pimples at some point and to some degree. If the problem has been traditionally acute in prior family generations, you are able to count on having it, too. If the issue looms on the horizon and appears as a genetically encoded time bomb, some preventive measures are definitely in order before the pimples develop. And if pimples have ever plagued you within the past, they might come back in the future, too. The most fundamental form of pimple prevention is hygiene and prophylactic (preventive) skin care. Normal washing of endangered or affected areas with mild soap is a should. Such soap need not necessarily contain any chemicals designed to prevent pimples - the only watchword is scrupulous hygiene. Nevertheless, face washing ought to not be overdone or the skin will turn out to be dehydrated and the problem will probably be exacerbated. Pimple-prone skin ought to be kept free of heavy makeup, particularly the kind that has a heavy fatty content. Theatrical makeup of any type and for any reason should be strictly avoided, as ought to the water-resistant type. Go for hypoallergenic grades of makeup - these might not have as spectacular a cosmetic effect, but they are definitely friendlier on pimple-prone skin. If you are on any kind of antidepressant or antipsychotic medications, check with both your psychiatrist and dermatologist about the possibility of skin changes. Women on birth control pills may wish to think about option techniques of contraception if recurrent pimple infestation is a issue for them. This change should be initiated in consultation having a qualified gynecologist. There's direct evidence linking fatty foods with the occurrence of pimples; and avoiding these foods on general principle can't be anything but an excellent idea. 1. Know your skin type. This is essential because not every product fits our skins. 2. Drinking plenty of water and fresh natural juices will not keep our skin moist, it will also benefit our entire health.. Drink at least 8 glasses of water everyday. 3. Clean your skin. Don't let dirt stays on your skin especially on your face. 4. Be gentle to our own skin. Also, do not apply skin care products or too much. 5. Keep it moisturized at all times. This is among the top skin care and more important. Keep it dry. Use moisturizers. Moisturizers for the best results when applied while the skin is still damp. 6. Avoid using soap on your face. Soap can be only used on the lower of the neck. 7. Use sunscreens with going under the sun. Harmful sun ray can cause damage to our skin. 8. Exercise daily if possible. Again this will not only benefit your skin but our entire also our body. 9. Get enough sleep. Avoid staying awake all night. Have at least 8 hours of sleep. After nine months of endurance and giving birth to a healthy child is a great experience which gives immense satisfaction to the moms, who had to lead a life maintaining a good and healthy regime. But the task is not over yet! Still a lot of modifications in the life style and health have to be worked out for to take care of the new born as well as to bring back the body in proper shape. Giving birth and enduring 9 months of pregnancy is a great experience that a woman can have. It’s a satisfaction to moms who endured all the pain and who had maintained a healthy lifestyle routine. But there are still a lot of things to be done after giving birth to a wonderful baby. Losing weight after giving birth can be a hard process. Nursing moms need to be extra cautious of the perfect time and procedures for losing weight. If you are breastfeeding your child experts does not usually advise such programs right after giving birth. It requires at least 500 additional calories for producing milk. Some of the effective ways to initiate your losing weight after pregnancy are to follow these tips. If you were not able to exercise during pregnancy, make sure that you start slowly. Excessive exercising may cause injury. Eat healthy snacks like lean meats and fruits. Use them whenever you are hungry and avoid other kinds of snacks which could add on calories. Do not eat foods which do not contain enough nutrients. Fruits, vegetables, nuts and whole grain foods are recommended. Eat several small meals a day. By eating in this manner your body will have a continuous supply of energy for you and your child, especially if you are breast -feeding. Remember that during the post partum stage your body requires at least 1500 calories if you are feeding your child. Any reduction in this will have an impact on your baby.